Naim wanted me to take a picture of his 2s chart. Naim had math playground, drama and interact theater. Aaron had engineering in which he made a small catapult out of craft sticks, binder clips and a spoon. Apparently this lead later to raisins being shot across the interact classroom, which scandalized Naim. Aaron did say that he picked them up and we did have a big talk about how Naim agreed to let him share the class with him so he needs to be respectful of that. Naim and I talked about how Aaron’s behavior is Aaron’s responsibility and Hillary and I will work with him on it, he does not have to worry about it. Hillary did not say anything to me, so either she handled it or we just didn’t cross paths. Avery and I played in the playroom, went to Library story time where the theme was opposites and he did a craft, and briefly played at the park. Naim did Sylvan 4 pp., a practice page of numbers and worked with the hundreds board on skip counting with 2s. 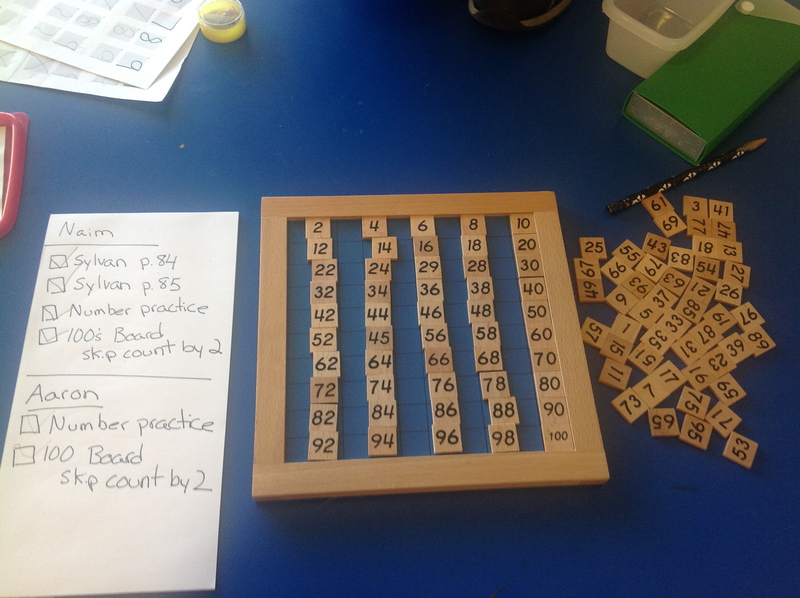 Aaron did not have his new Sylvan book yet (came the next day) so he just did the numbers practice and the hundreds board.